The Sumatran tiger (Panthera tigris sumatrae) is the smallest of all tiger subspecies and is native to the Indonesian island of Sumatra. It lives in forest habitats in both lowland and mountainous areas. Its stripes are narrower than those of other tiger species and it also has a distinctive bearded and maned appearance, especially the males. Sumatran tigers face many threats including habitat loss, fragmentation and poaching for the illegal trade in traditional medicine. Although there are some protected areas for the tiger on Sumatra and conservation efforts are continuing, many tigers are killed by poachers even within the protected zones. As a result of all this and the declining population, the International Union for Conservation of Nature (IUCN) has listed the Sumatran tiger as a Critically Endangered species. 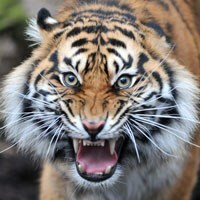 This means that the Sumatran tiger is considered to be facing an extremely high risk of extinction in the wild. Our Sumatran tigers are part of the European Endangered Species Breeding Programme.